At Gen Con, we got a chance to demo several new and exciting games. 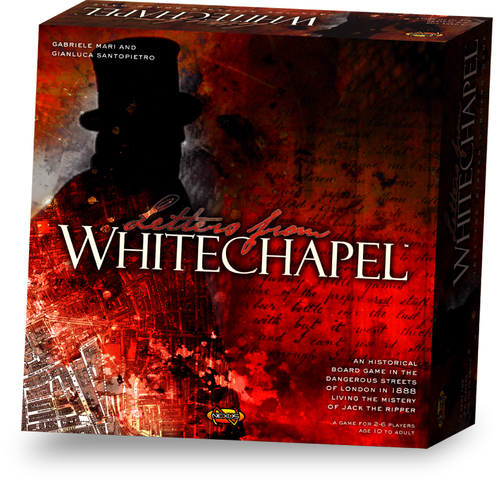 One of them was a thrilling detective game, Letters from Whitechapel. 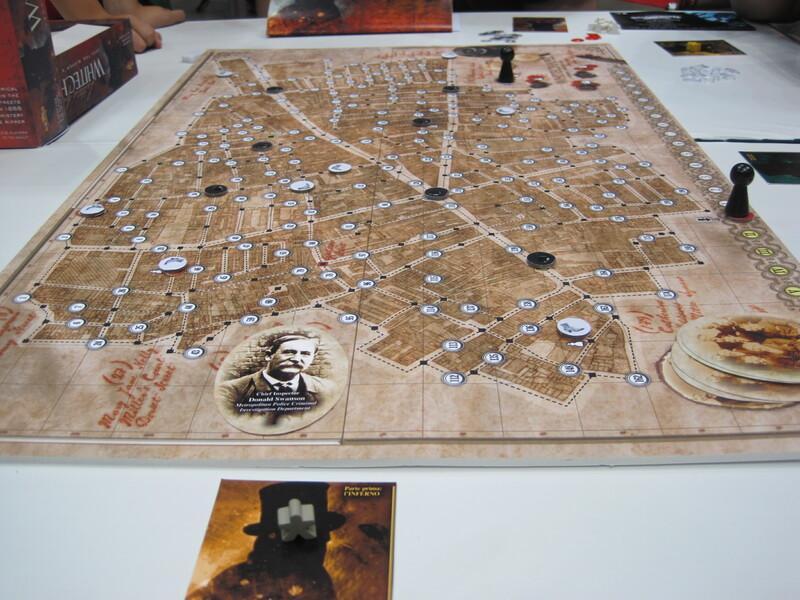 The game is set in London in 1888 during the killing spree of Jack the Ripper. One character controls Jack while the others play constables trying to arrest him. How does it work? 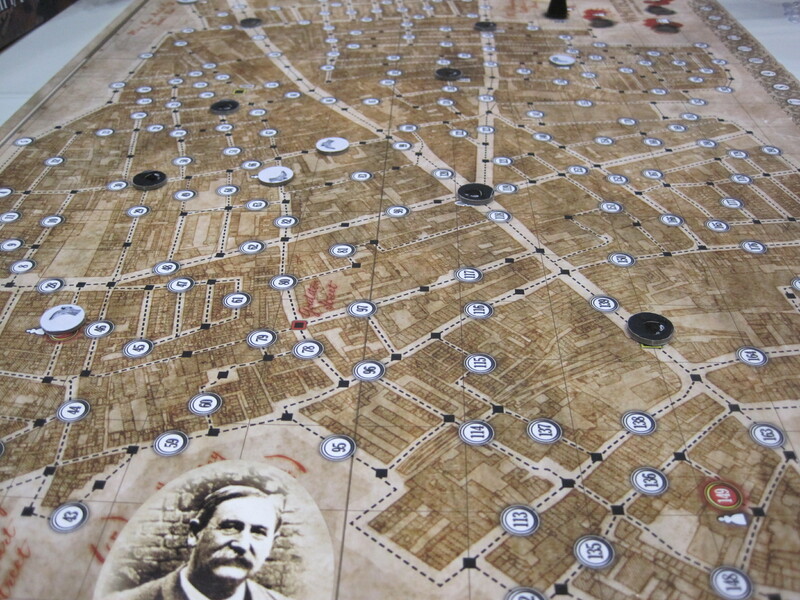 The game board (a period map of Whitechapel) is covered in more than one hundred numbered circles, and each of these circles is a possible hiding place for Jack. The players go in turn moving about the board investigating the numbered scenes, while Jack moves about the board unseen (the players have visible game pieces, but Jack denotes his movements on a notepad and has no game piece). The detectives must use strategy and a fair bit of luck as they work together to catch Jack before the fifteenth night, after which he escapes and wins the game. What I really liked about the game is the amount of detail the designer put into it. The game board looks like an actual period map, and the five murders happen at the historically accurate place on the map. Each of the detective cards (used to determine who leads the investigation each turn) denotes an actual picture of a Scotland Yard detective that worked the case. The detail that truly impressed me was that on the third “night” of the game, Jack kills two of his five victims. This detail closely follows the actual events of September 30, 1888, when The Ripper killed Liz Stride (but was interrupted), and then killed Catherine Eddowes in the same night. When I saw that detail, it was clear to me that the designers had done their homework on the Ripper murders. My only complaint, and it is a small one, was that the game pieces that represent the detectives were a bit lame. I would give the game a four out of five. The game requires 2-6 players, and takes about 90 minutes to complete. It is available from the Nexus Games website.